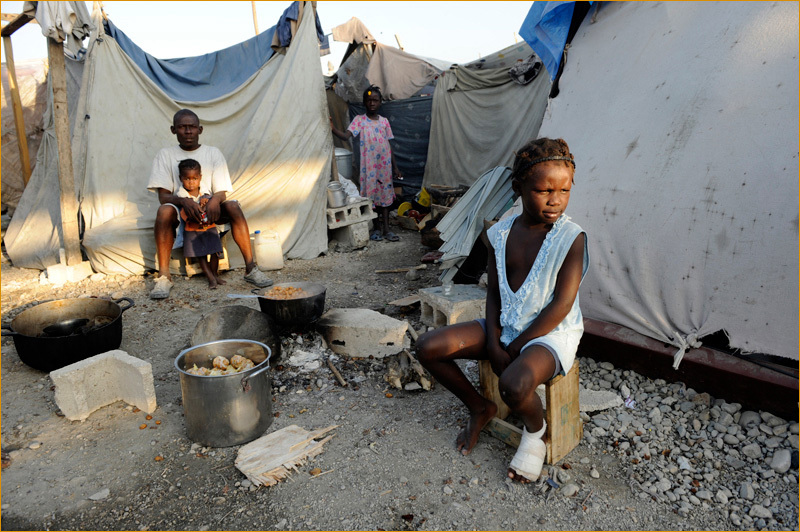 When we witness tragedies as devastating as the current crisis that has unfolded in Haiti, it is easy to lose oneself within the vertigo of statistics and to forget that these numbers pale in comparison to the grief and anguish that repeats itself in countless stories. Coffins, improvised morgues, wounded or sick people in saturated hospitals, and every day life that now occurs publicly in the streets, barely let us see the magnitude of the events. An experience such as this, however often we see it repeat itself in our screens, goes beyond our comprehension, and more often than not, pushes us to feel comfortably numb. However, it is thanks to photographic documents such as this one that Peter Turnley shares with us, that we are able to recover a fistful of stories and to recognize, in each one of the photographed faces, somebody that up until a few days ago, led a very different life. A life with sadness and joy, not too different from our lives, where death was not present on every corner and food didn't have to be sought after very long lines. But these images also serve as a testimony on human ability to overcome adversity; they speak about solidarity amongst countries that may otherwise remain distant, and tell us a story about hope that is built slowly from the debris. Let us walk together, with our gaze, on this brief but intense journey, presented by these photographs that show us not only personal tragedy, but also the humanity that we share. 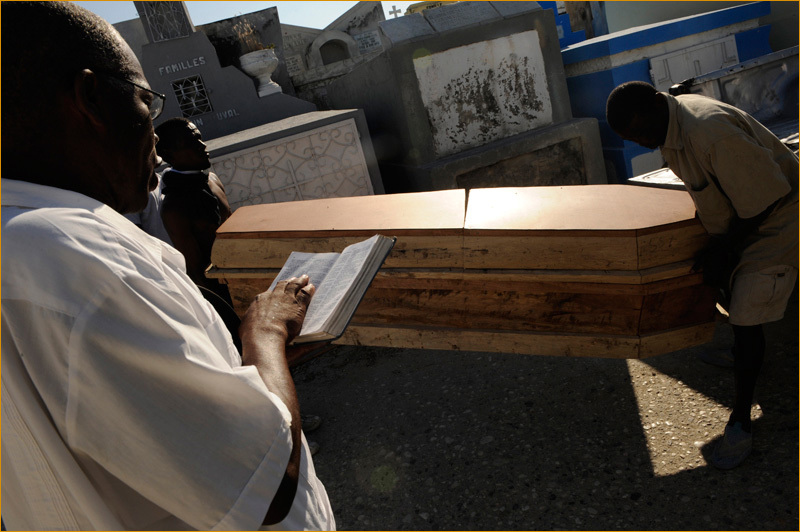 1/50 | A burial in the Grand Cimetière of Port-au-Prince, Haiti. 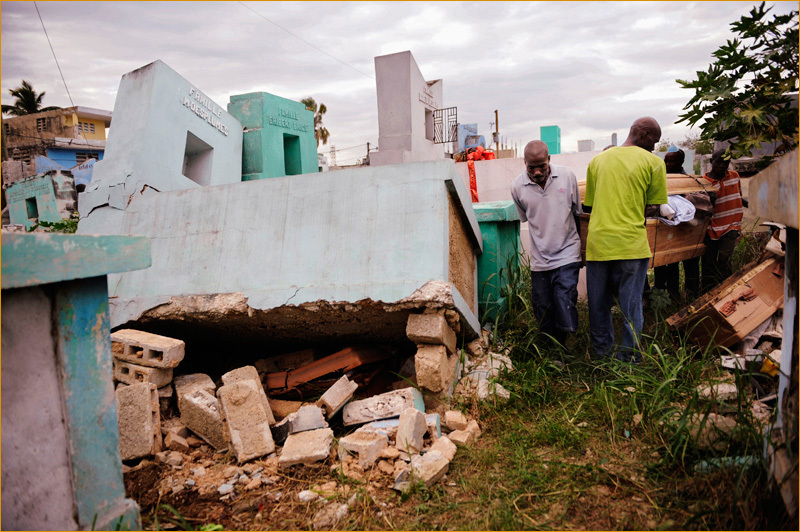 With more than two hundred thousand people killed by the magnitude 7.0 earthquake in Haiti on Jan. 12, Haitians continue to bury their dead. Port-au-Prince, Feb. 1, 2010. 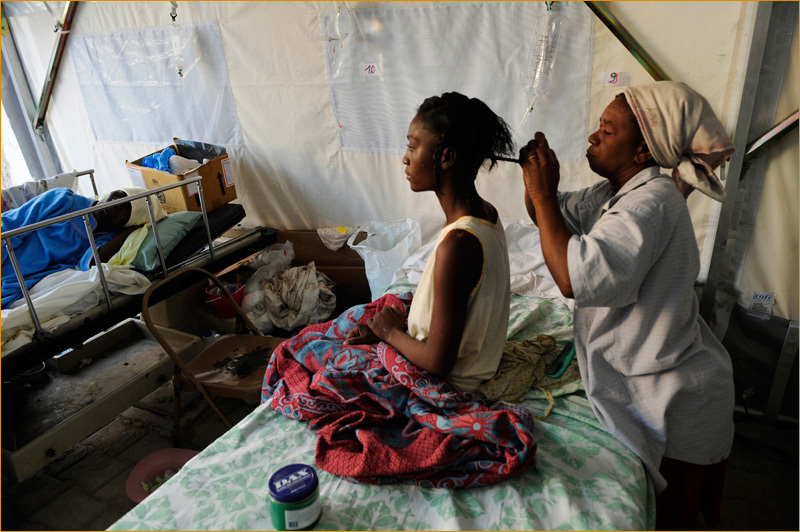 2/50 | The General Hospital of Port-au-Prince, Haiti. 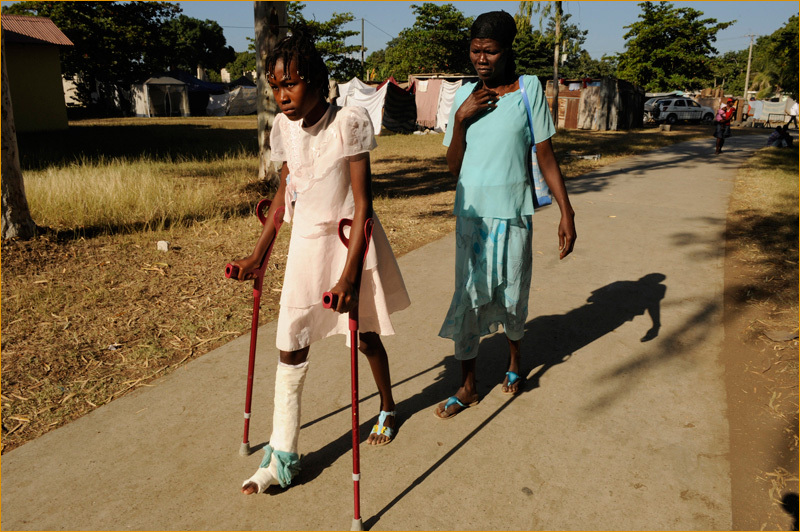 Hundreds of thousands of Haitians have been left seriously injured. Jan. 31, 2010. 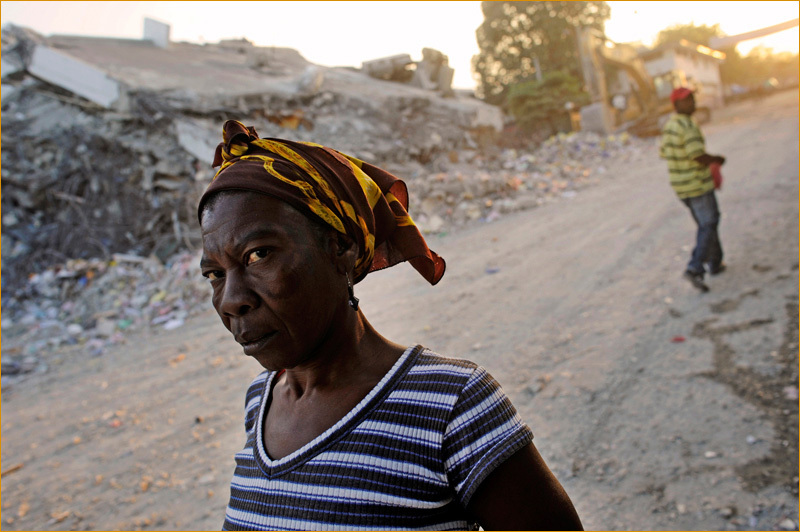 3/50 | Irana Cemelus, 54, a victim of the Haitian earthquake, is buried by her family in the Grand Cimetière of Port-au-Prince. Feb.3, 2010. 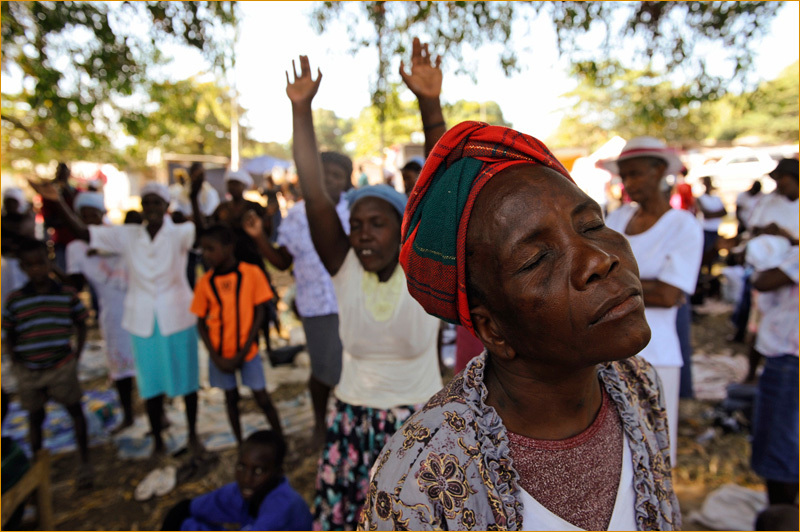 4/50 | With many churches and cathedrals destroyed by the earthquake, Haitians pray outdoors, near the Champs de Mars, Port-au-Prince. Sunday, Jan. 31. 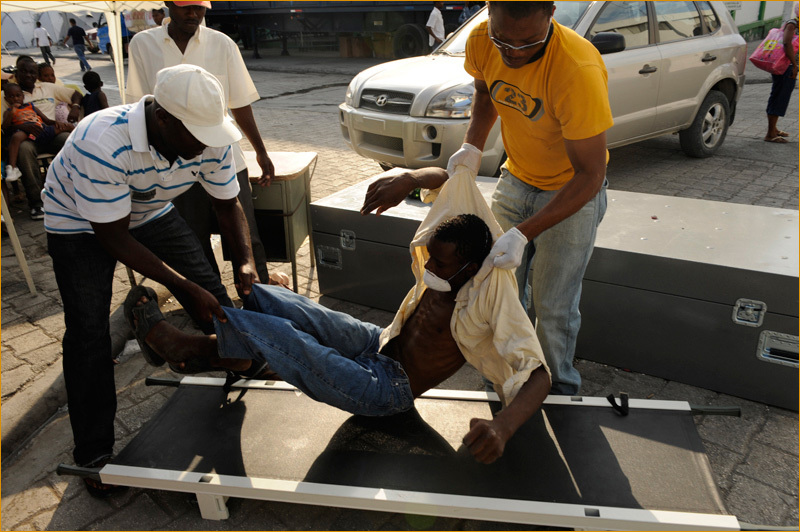 5/50 | A victim of the Haiti earthquake is brought to be prepared for burial at the the morgue of the General Hospital of Port-au-Prince, Haiti. Jan.31. 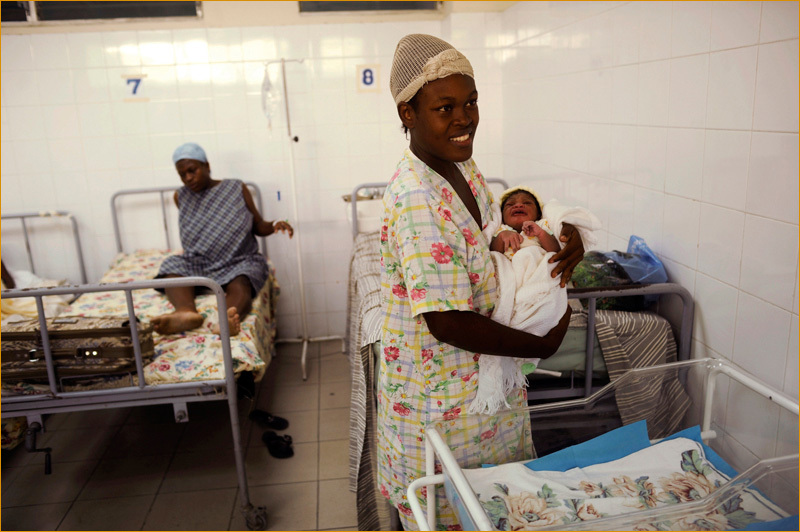 6/50 | Bemur Lidthany, 28, with her baby girl, Christaly Lidthany, born 25 minutes earlier at the Hopital de la Paix in Port-au-Prince. Jan. 31, 2010. 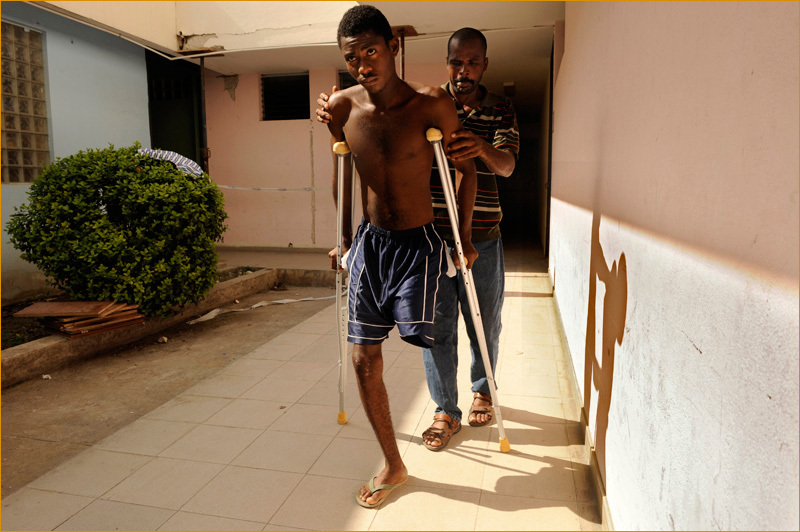 8/50 | At the Hopital de la Paix of Port-au-Prince, a young man learns to walk with one leg after a recent amputation as a result of his serious injuries during the earthquake. Jan.31, 2010. 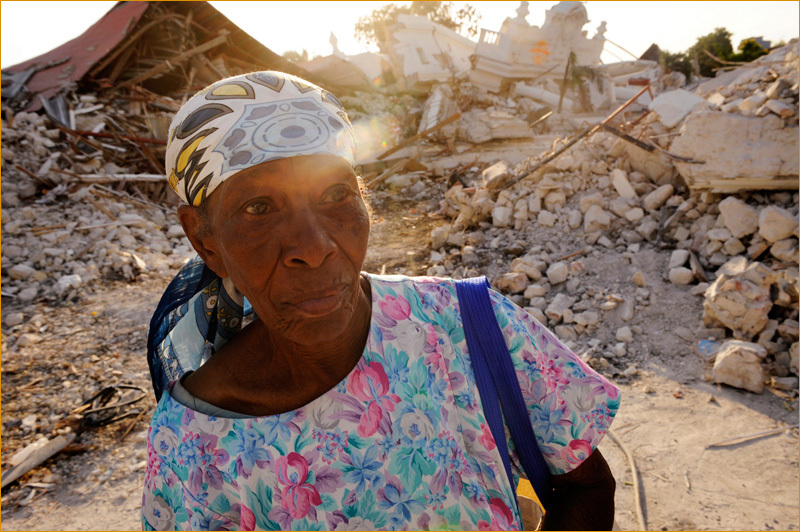 9/50 | Several million people have been left homeless and/or injured. Many people still sleep outdoors in the streets. Delmas district, Port-au-Prince, Jan. 31, 2010. 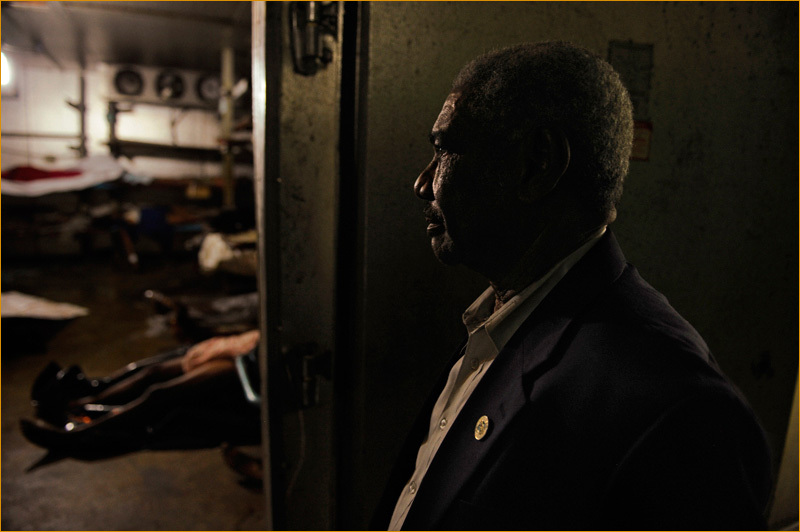 10/50 | Jean Grousse looks for his son, Gerd Belizaire, 33, in the morgue of the General Hospital of Port-au-Prince. 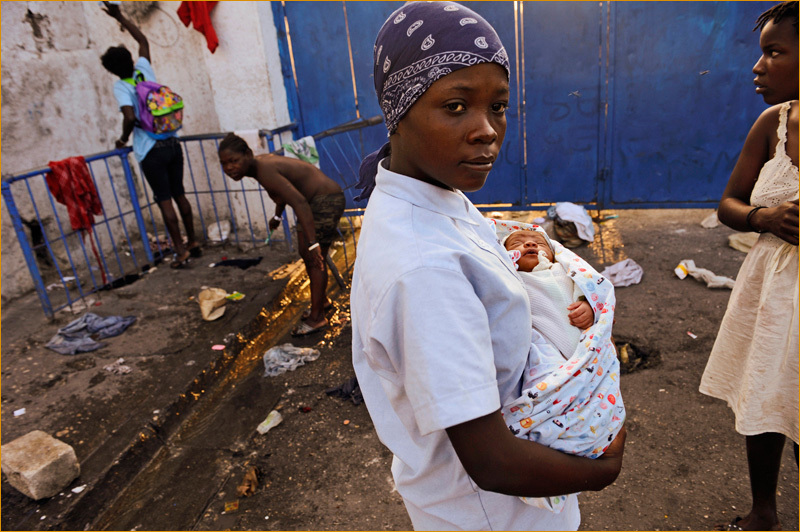 11/50 | A young woman and her recently born baby are among the millions of Haitians who have been left homeless as a result of the Haiti earthquake. Near the Champs de Mars, Port-au-Prince. Jan. 31, 2010. 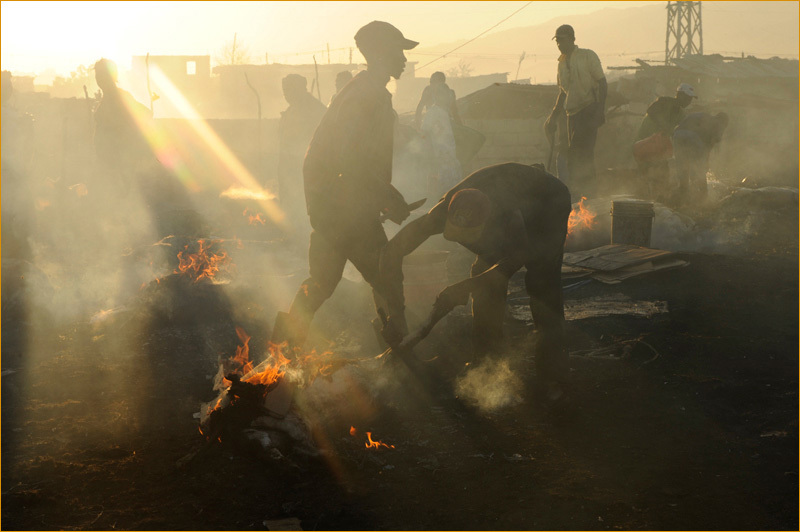 12/50 | At the major outdoor market La Saline, on the outskirts of Port-au-Prince, Haiti, men burn and butcher pigs that have been slaughtered. Feb. 2, 2010. 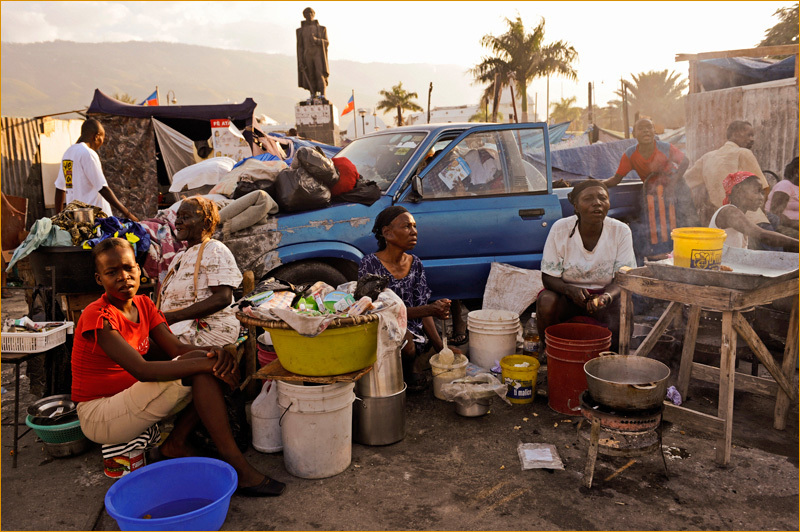 13/50 | At a makeshift camp at the Champs de Mars, Haitians bath themselves outdoors. Jan. 31. 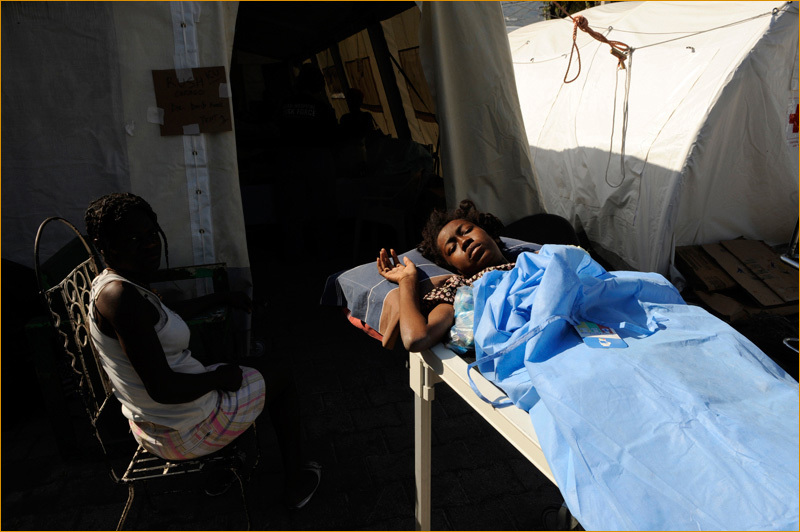 14/50 | A young woman, with her right arm recently amputated, in a tent in front of the General Hospital of Port-au-Prince. Feb. 2. 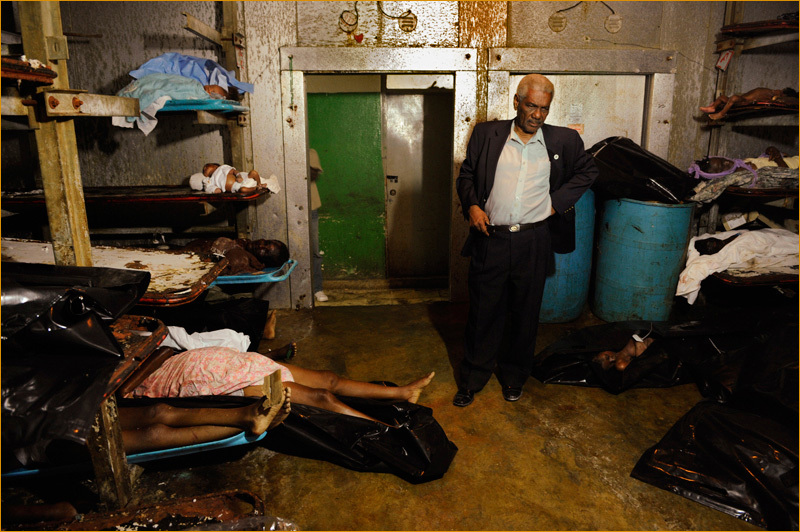 15/50 | A body is tagged with an identification number at the morgue of the General Hospital of Port-au-Prince, Haiti. This one of thousands of dead bodies have been brought to this morgue since the earthquake. Jan. 31, 2010. 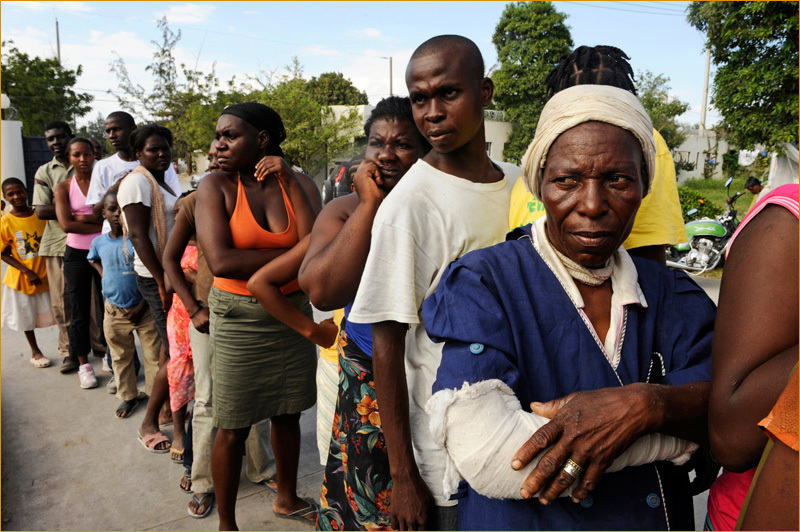 16/50 | Haitians left homeless by the earthquake stand in line waiting for food near the city of Fontamara, on the road to Rail. Feb. 2, 2010. 17/50 | A makeshift tent encampment. Feb. 3. 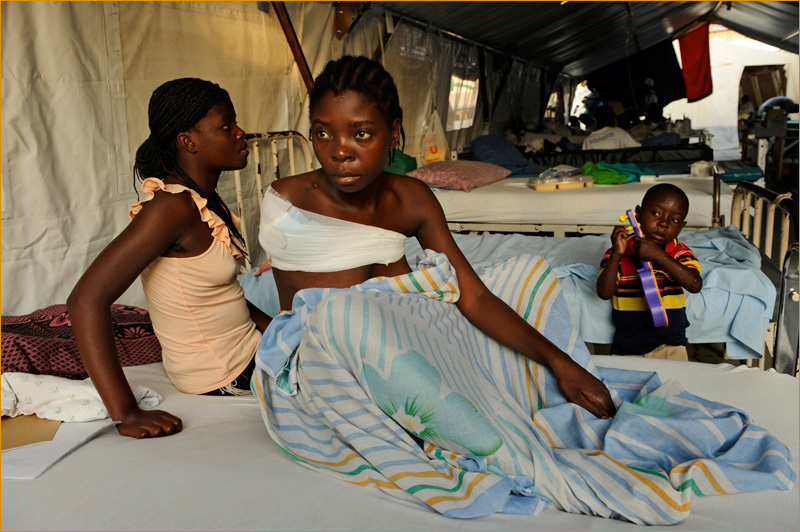 18/50 | The General Hospital of Port-au-Prince, Haiti. Jan. 31, 2010. 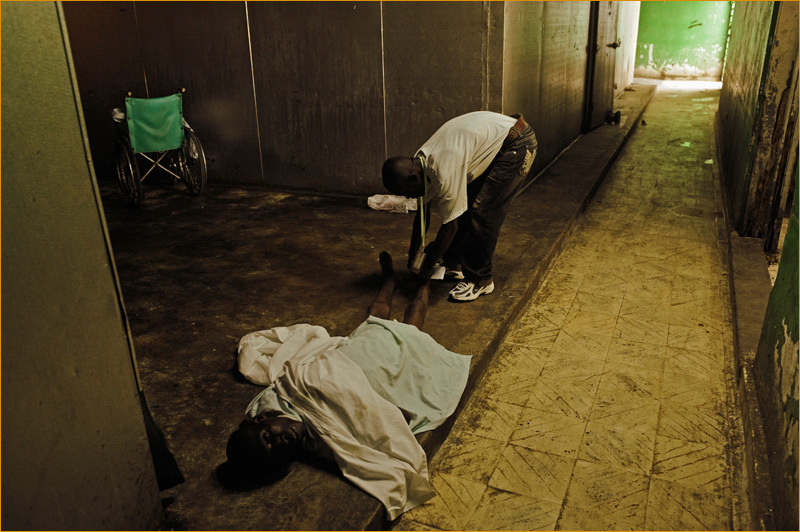 19/50 | Jean Grousse looks for his son, Gerd Belizaire, 33, in the morgue of the General Hospital of Port-au-Prince, Haiti. He could not find him. Jan. 31, 2010. 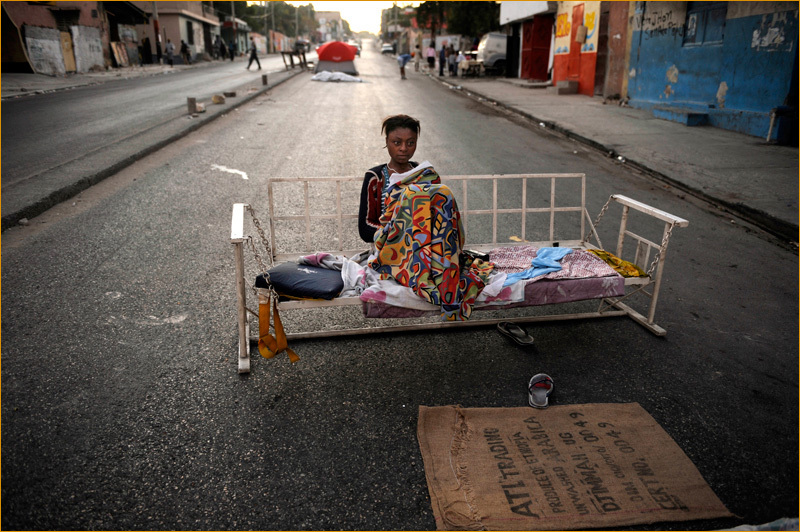 20/50 | Micheline Merius, 22, homeless since the earthquake, sleeps nightly on the streets of Delmas 10/12. Feb. 2. 21/50 | At the General Hospital, Feb. 3. 22/50 | Between Port-au-Prince and Leogane. Feb. 3. 23/50 | Champs de Mars. Jan. 31. 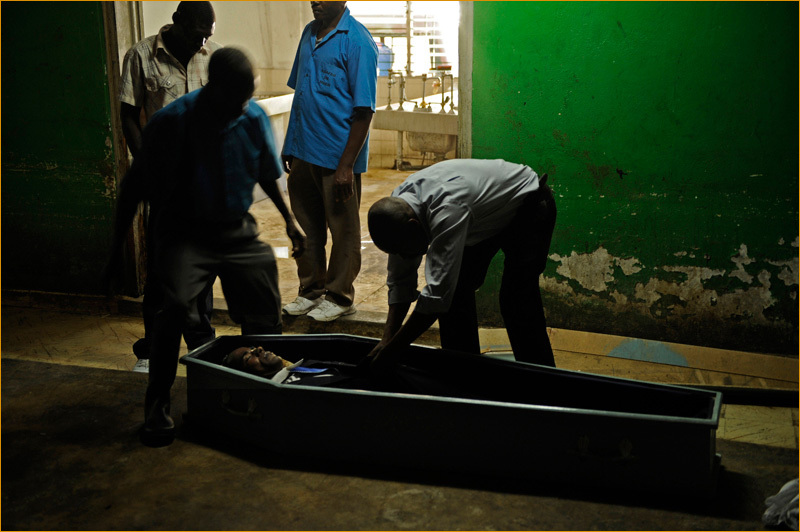 24/50 | A body being taken for burial outside the morgue of the General Hospital. Jan. 31, 2010. 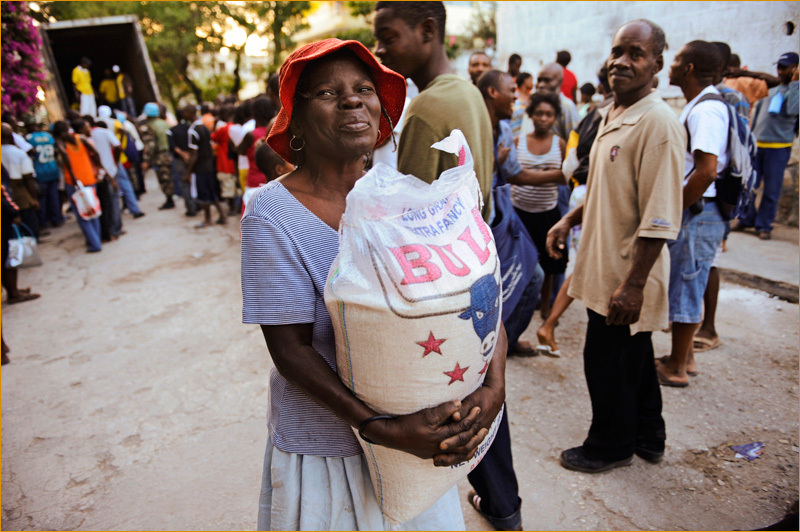 25/50 | A morning food distribution run by the World Food Program in Delmas 62, Port-au-Prince. Feb. 1. 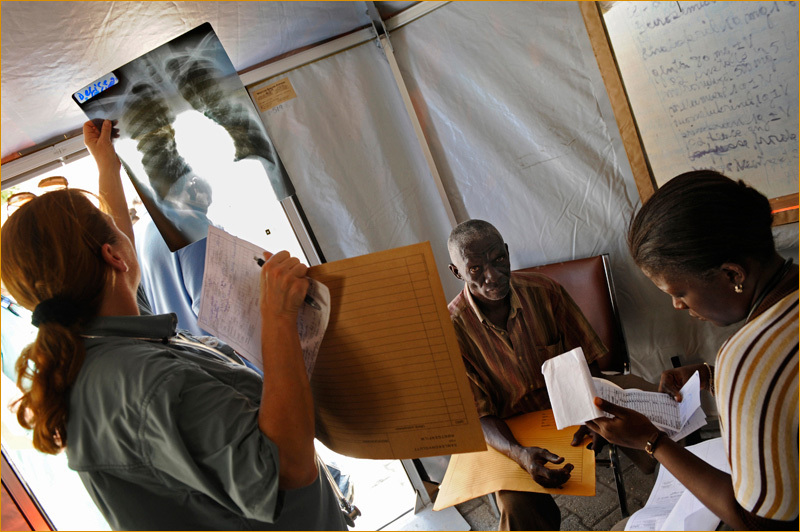 26/50 | Dr. Lora Chamberlain, from Chicago, examines X-rays of an injured man in a temporary medical tent outside of the hospital. 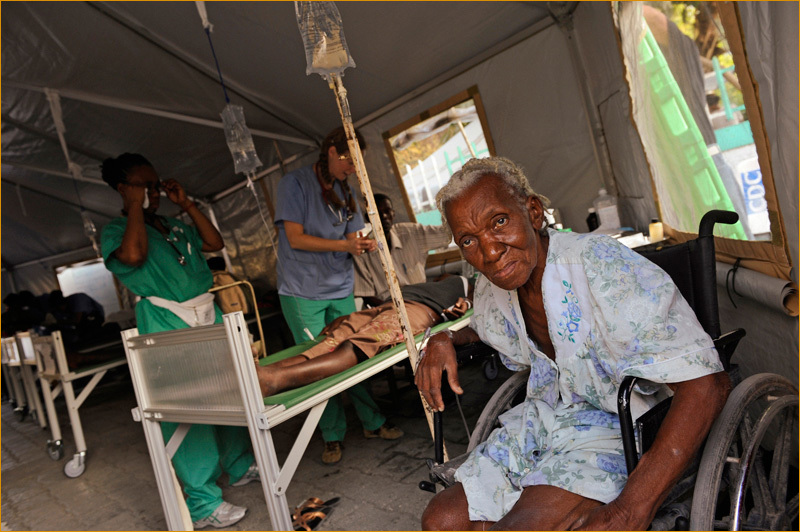 She is a volunteer with AMHE, the Association of Haitian Physicians Abroad. Feb. 2, 2010. 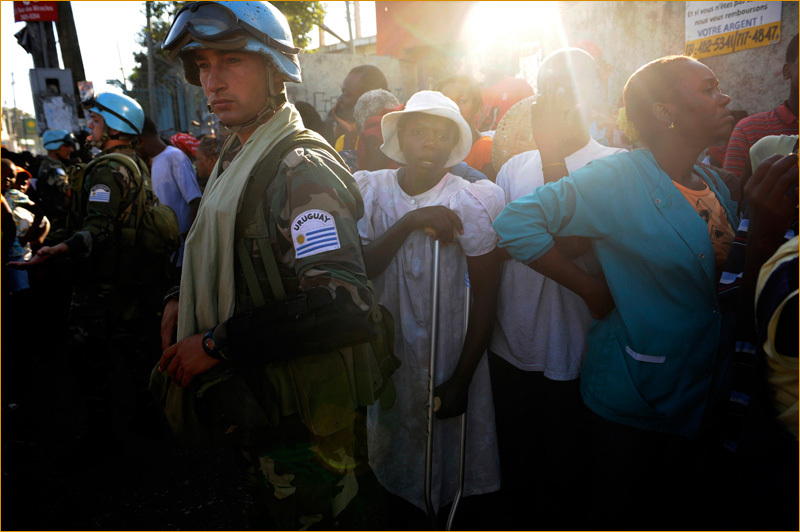 27/50 | United Nations soldiers oversee a food distribution in central Port-au-Prince. Feb. 2. 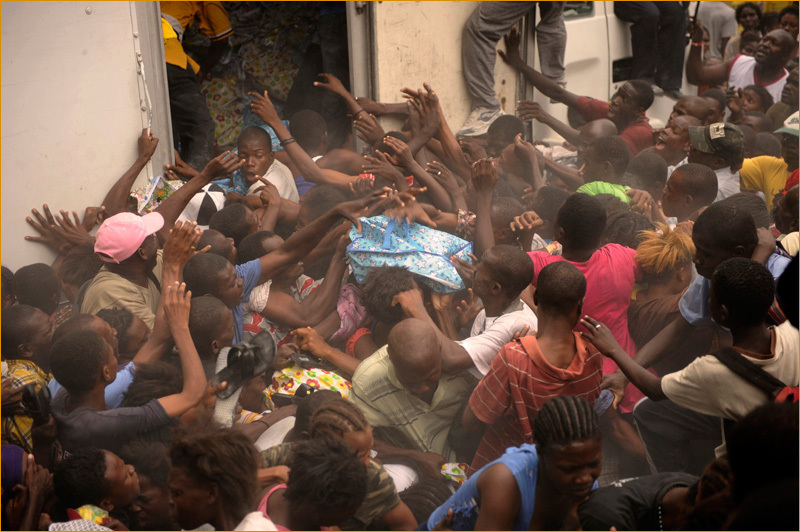 28/50 | Slowly, daily life commerce returns to Port-au-Prince. Feb.2, 2010. 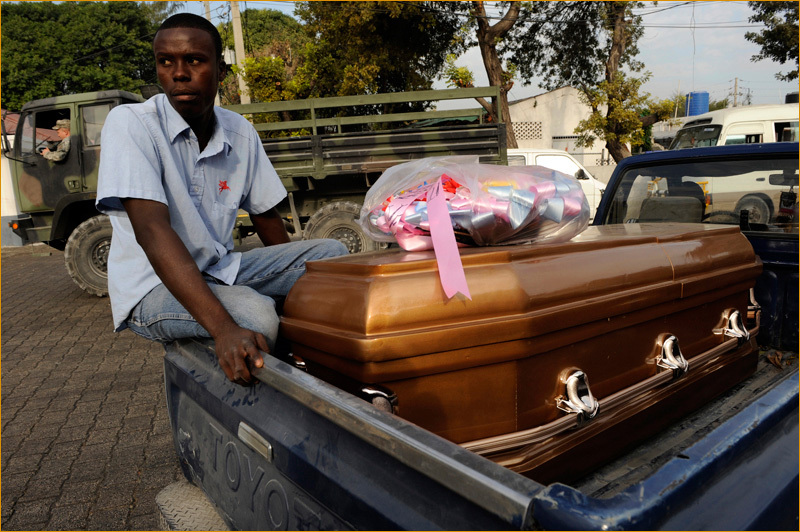 29/50 | A relative of a dead victim of the earthquake accompanies a coffin on the way to burial. Jan. 31. 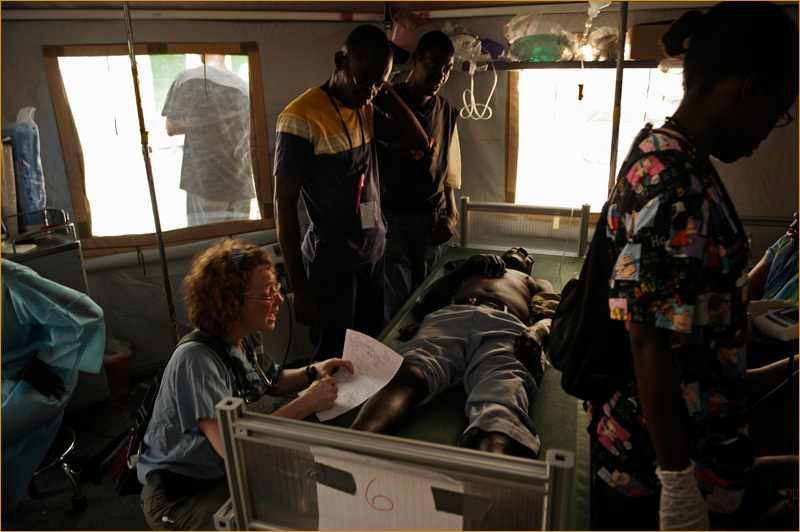 30/50 | Dr. Heather Costello, a volunteer in Haiti from the University of Chicago, North Shore, working with IMC, the International Medical Corps, examines an injured man in a temporary medical tent outside of the General Hospital. Feb.1, 2010. 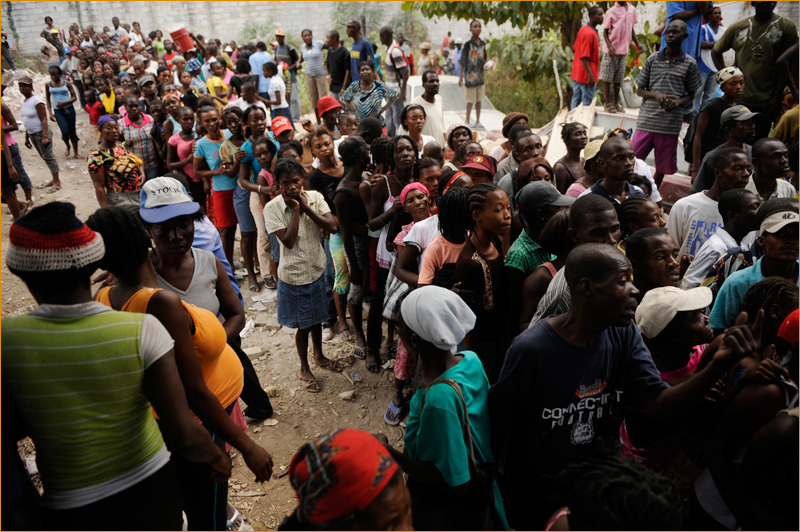 31/50 | A food line outside the Hopital de la Paix, Port-au-Prince. Jan. 31. 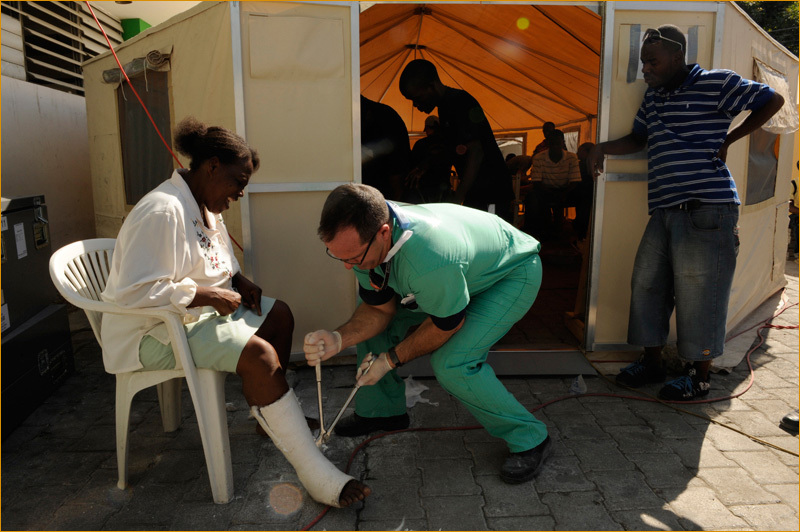 32/50 | A volunteer doctor, Dr. John Von Thron, an orthopedic surgeon from Jacksonville, Florida, takes off the cast of Meplisea Servius outside the General Hospital of Port-au-Prince. Feb. 1, 2010. 33/50 | An injured man is brought to the General Hospital, Jan. 31. 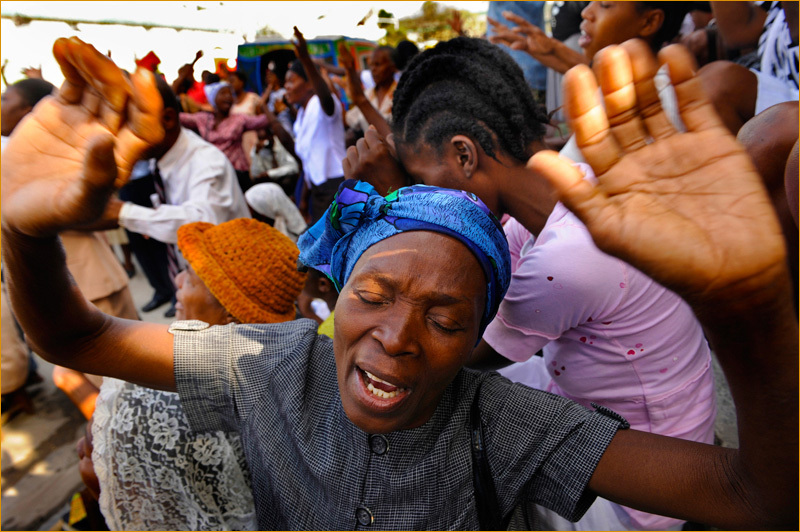 34/50 | Sunday prayers near the Champs de Mars in central Port-au-Prince. Jan. 31. 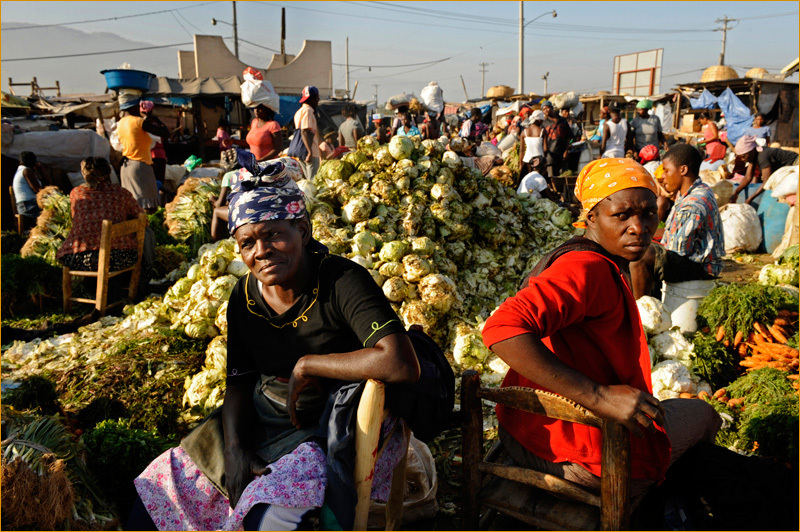 35/50 | A food distribution near the Champs de Mars. Feb.1, 2010. 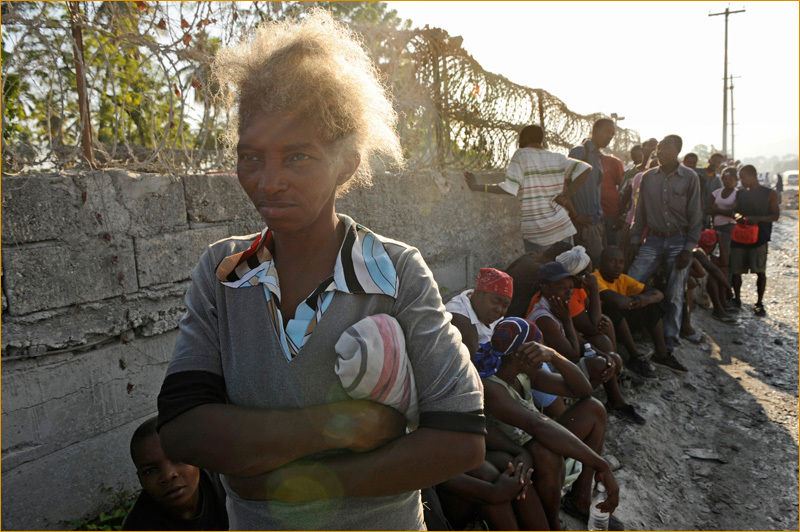 36/50 | A food distribution line. 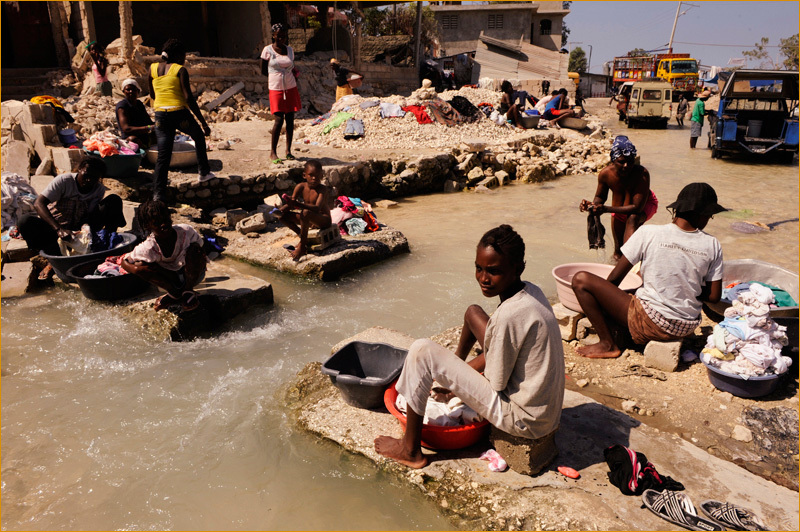 Central Port-au-Prince. Feb.1, 2010. 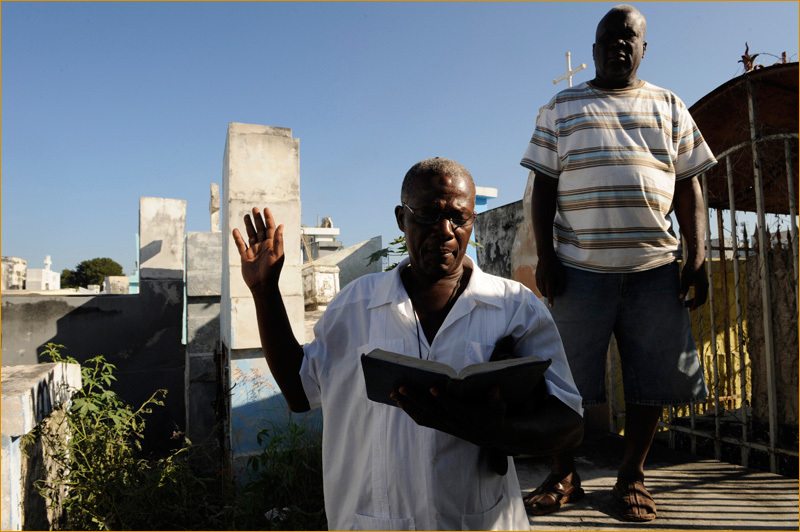 37/50 | The Grand Cimetière of Port-au-Prince, Haiti. Jan. 31, 2010. 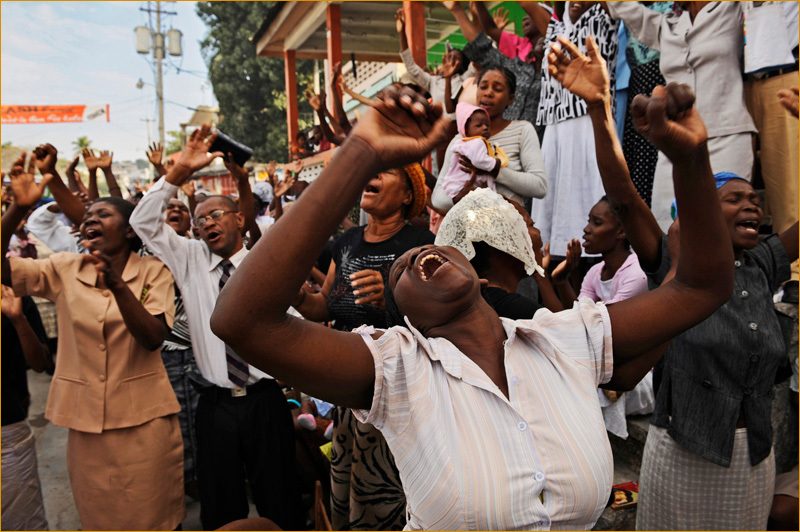 38/50 | A prayer service for victims of the Haiti earthquake, outside a hospital in Leogane, Haiti. Feb. 2, 2010. 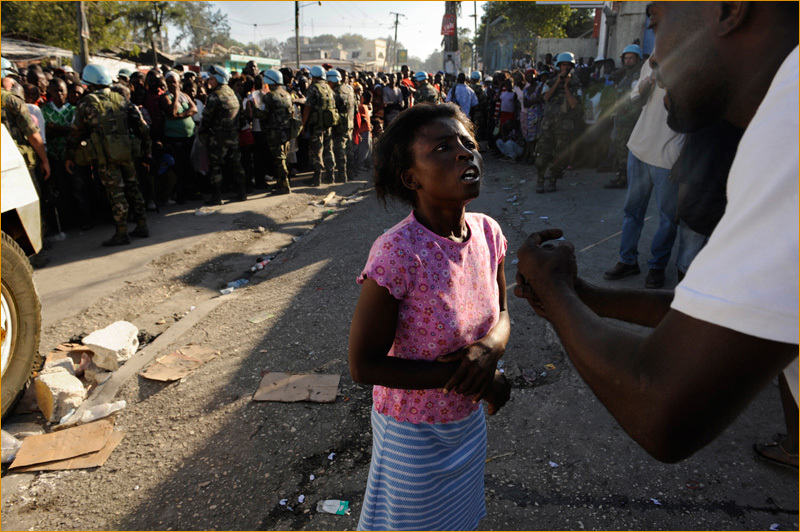 39/50 | Central Port-au-Prince, Haiti. Jan. 31. 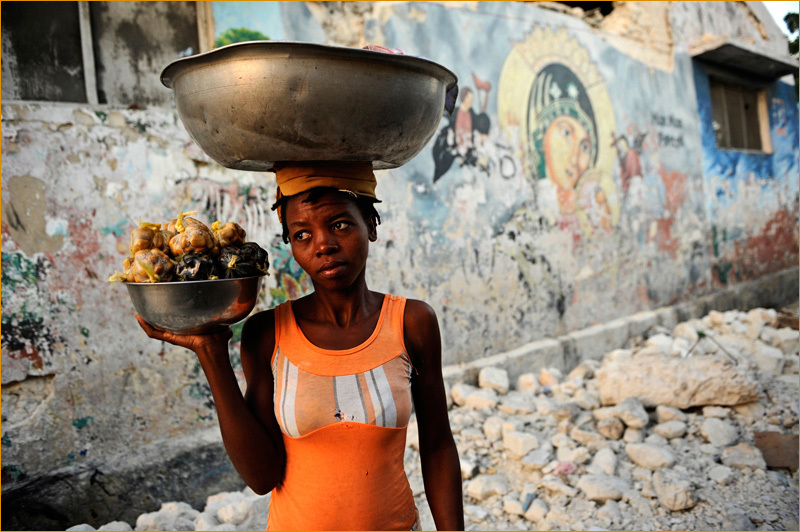 40/50 | Port-au-Prince, Haiti. Jan. 31, 2010. 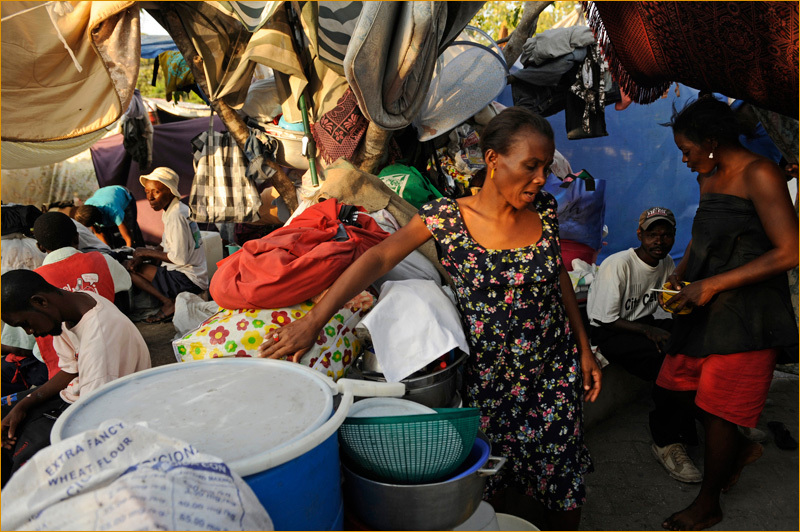 41/50 | A few weeks after the earthquake, while many Haitians lack food, life comes back to the grand market, La Saline, on the outskirts of Port-au-Prince. Feb. 3, 2010. 42/50 | Leogane, Haiti, Feb. 2. 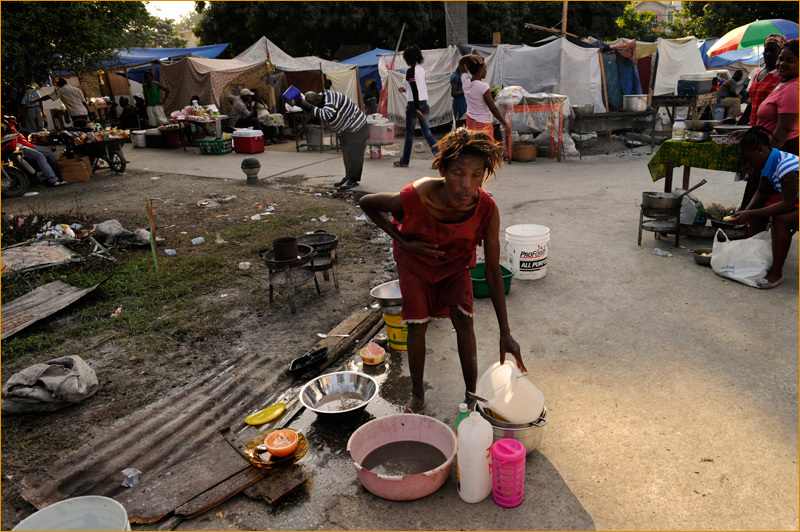 43/50 | Thousands of homeless Haitians live in a makeshift encampment at the Champs de Mars in central Haiti. Jan. 31, 2010. 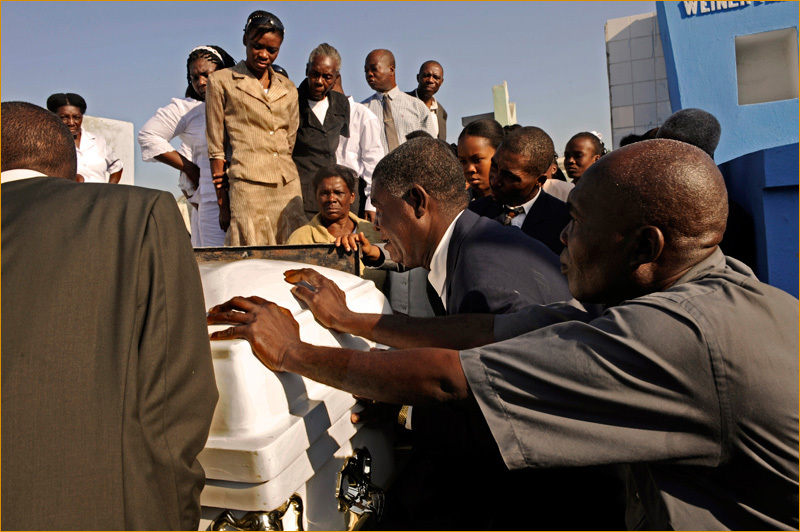 44/50 | Fritz Larose, 59, right, buries his son Clifford, 24 in the Grand Cimetière of Port-au-Prince, Feb. 1, 2010. 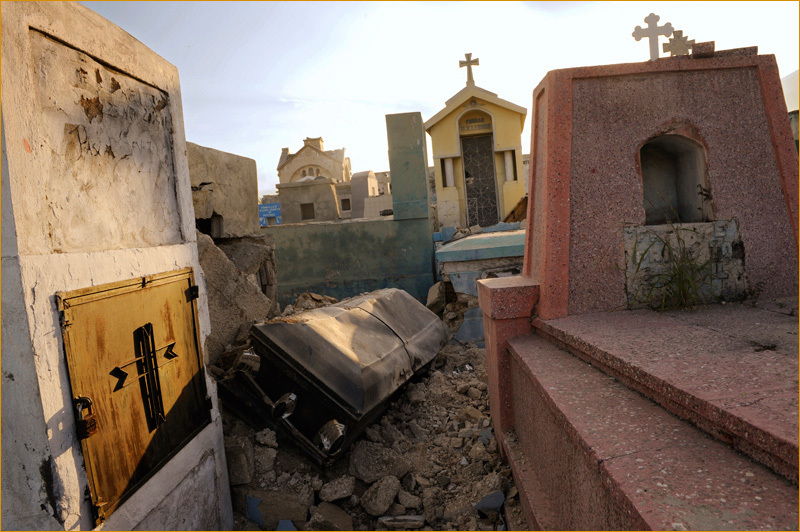 He lost both his daughter and son when their house collapsed during the earthquake. 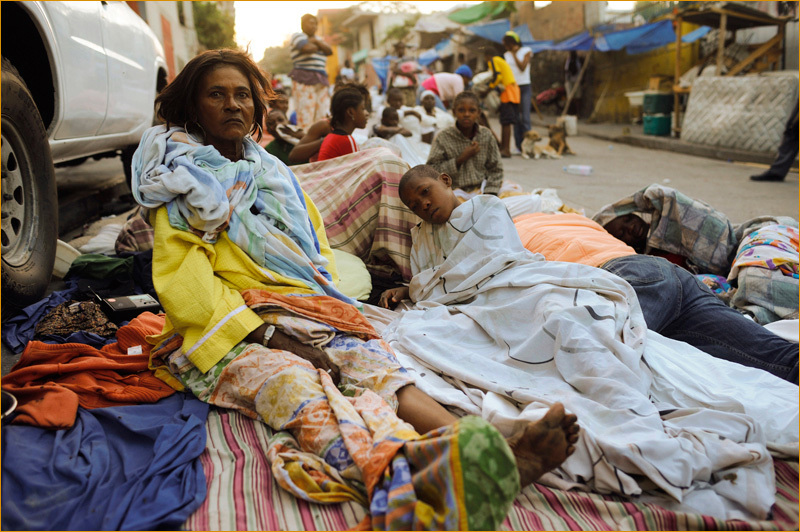 45/50 | A mother and son in a makeshift encampment for homeless Haitians in the Champs de Mars, Port-au-Prince. Jan. 31. 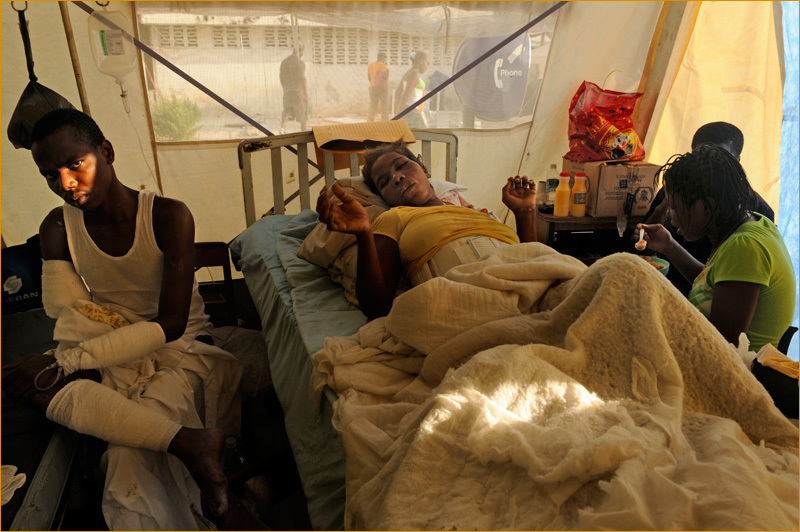 46/50 | An injured victim of the earthquake at the General Hospital of Port-au-Prince. Feb. 1. 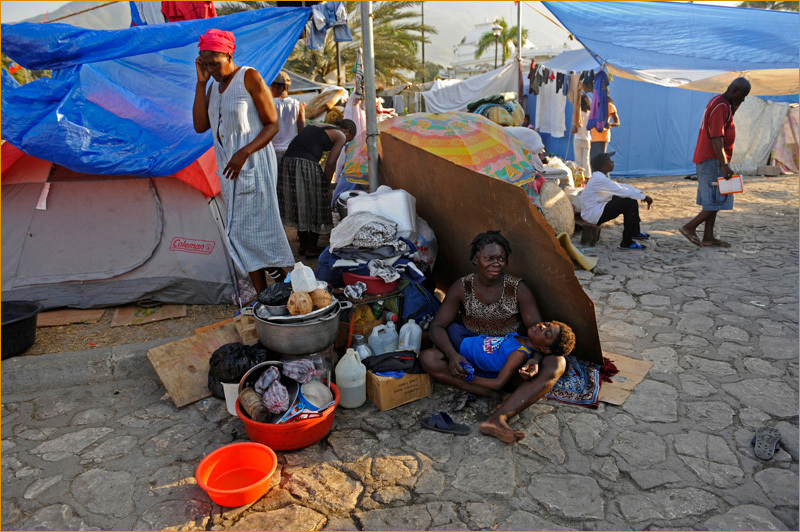 47/50 | Thousands of victims of the Haiti earthquake live in a makeshift tent encampment in the Champs de Mars. Jan. 31, 2010. 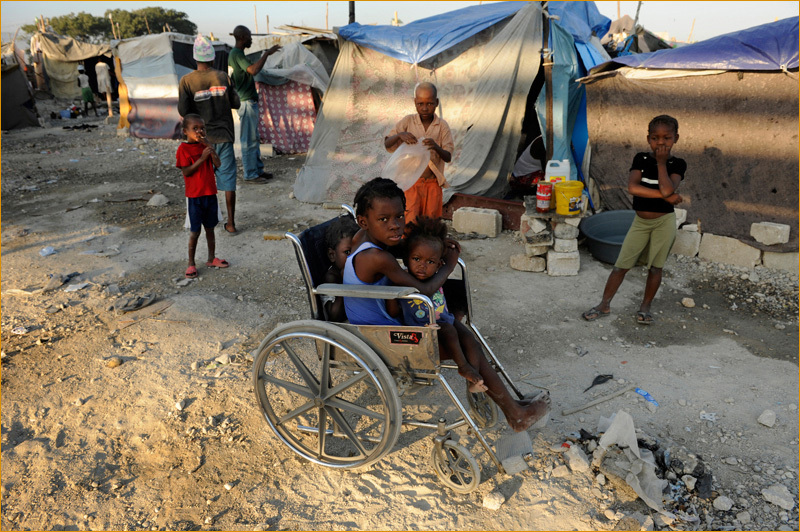 48/50 | Homeless victims at an encampment on the outskirts of Port-au-Prince. Feb. 2. 49/50 | Port-au-Prince, Jan. 31, 2010. 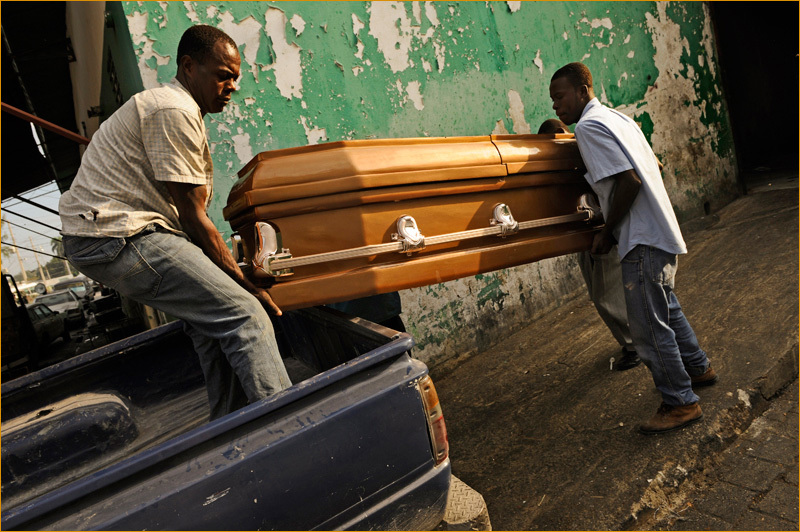 50/50 | A young man accompanies the casket of a dead victim on the way to burial. Port-au-Prince, Haiti, Jan. 31, 2010. All images in this post are copyright 2010 by Peter Turnley / Corbis. All rights reserved. its photo is very painful and hopeful. Hello Peter, I'm just following from your FB. You have a stunning work. I like to see your pictures as they really show how the world will shape. Thanks. Rex. I am the editor of publications for the University of Chicago Medical Center and we are interested in obtaining this photo. We would use it very small, one time. Can you tell me the cost? autor: gracias por sentir y transmitirlo foto´gráficamente. Me encantaron por la alta capacidad que tienen estas fotos para sensibilizarnos con la tremenda fuerza de la vida y la muerte. No es el primer trabajo que veo de éste gran fotógrafo y no deja de sorprenderme la manera tan especial de ver el mundo a traves de sus ojos en circunstancias tan adversas, sin necesidad de llegar al morbo de la sangre o muerte excesiva hace que sus imágenes transmitan la pobreza, desesperanza, shock, hambre, desesperación, frustracion, descontrol, etc. que toda la gente de Haiti debe de estar padeciendo en éste instante, en una labor periodística de primer nivel y que grato es que ZoneZero pueda mostrar éste tipo de colecciones para aprrendizaje visual de todos nosotros muchas gracias.